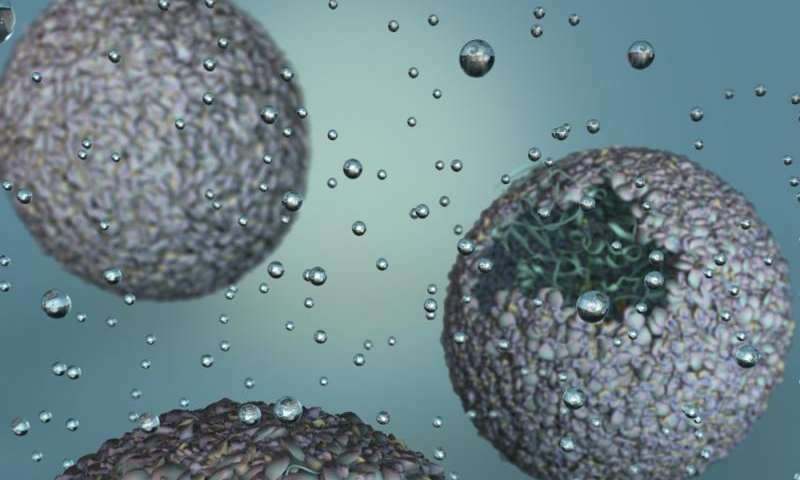 Scientists at Indiana University have created a highly efficient biomaterial that catalyzes the formation of hydrogen—one half of the "holy grail" of splitting H2O to make hydrogen and oxygen for fueling cheap and efficient cars that run on water. A modified enzyme that gains strength from being protected within the protein shell—or "capsid"—of a bacterial virus, this new material is 150 times more efficient than the unaltered form of the enzyme. 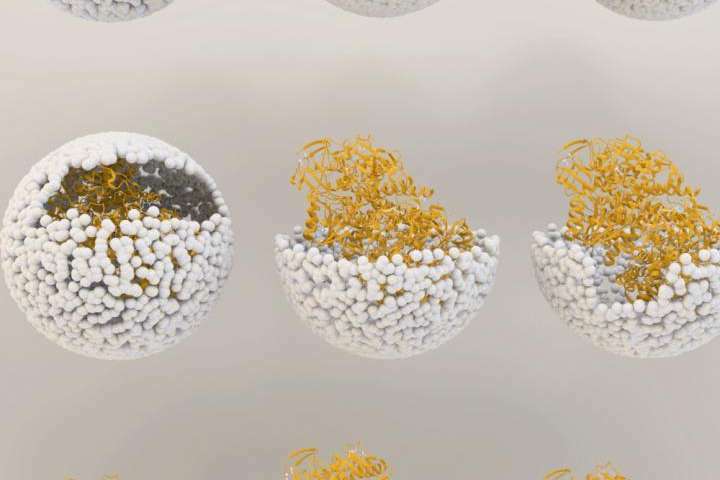 The process of creating the material was recently reported in "Self-assembling biomolecular catalysts for hydrogen production" in the journal Nature Chemistry. "Essentially, we've taken a virus's ability to self-assemble myriad genetic building blocks and incorporated a very fragile and sensitive enzyme with the remarkable property of taking in protons and spitting out hydrogen gas," said Trevor Douglas, the Earl Blough Professor of Chemistry in the IU Bloomington College of Arts and Sciences' Department of Chemistry, who led the study. "The end result is a virus-like particle that behaves the same as a highly sophisticated material that catalyzes the production of hydrogen." Other IU scientists who contributed to the research were Megan C. Thielges, an assistant professor of chemistry; Ethan J. Edwards, a Ph.D. student; and Paul C. Jordan, a postdoctoral researcher at Alios BioPharma, who was an IU Ph.D. student at the time of the study. The resulting biomaterial, called "P22-Hyd," is not only more efficient than the unaltered enzyme but also is produced through a simple fermentation process at room temperature. "This material is comparable to platinum, except it's truly renewable," Douglas said. "You don't need to mine it; you can create it at room temperature on a massive scale using fermentation technology; it's biodegradable. It's a very green process to make a very high-end sustainable material." In addition, P22-Hyd both breaks the chemical bonds of water to create hydrogen and also works in reverse to recombine hydrogen and oxygen to generate power. "The reaction runs both ways—it can be used either as a hydrogen production catalyst or as a fuel cell catalyst," Douglas said. The form of hydrogenase is one of three occurring in nature: di-iron (FeFe)-, iron-only (Fe-only)- and nickel-iron (NiFe)-hydrogenase. The third form was selected for the new material due to its ability to easily integrate into biomaterials and tolerate exposure to oxygen. NiFe-hydrogenase also gains significantly greater resistance upon encapsulation to breakdown from chemicals in the environment, and it retains the ability to catalyze at room temperature. Unaltered NiFe-hydrogenase, by contrast, is highly susceptible to destruction from chemicals in the environment and breaks down at temperatures above room temperature—both of which make the unprotected enzyme a poor choice for use in manufacturing and commercial products such as cars. These sensitivities are "some of the key reasons enzymes haven't previously lived up to their promise in technology," Douglas said. Another is their difficulty to produce. "No one's ever had a way to create a large enough amount of this hydrogenase despite its incredible potential for biofuel production. But now we've got a method to stabilize and produce high quantities of the material—and enormous increases in efficiency," he said. "Douglas' group has been leading protein- or virus-based nanomaterial development for the last two decades. This is a new pioneering work to produce green and clean fuels to tackle the real-world energy problem that we face today and make an immediate impact in our life in the near future," said Lee, whose work has been cited in a U.S. Congressional report on the use of viruses in manufacturing. There is a Lady that Brews Alcohol in her guts and Judge Pardoned her this week with No DUI Punishment. Just make sure that no one gets the P22-Hyd in their interior! If it does manage to get in, Not Just a Car - You will be a Paradise-bound Rocket at a Hellish Speed! It uses Nickel, not Nitrogen. "...splitting H2O to make hydrogen and oxygen for fueling cheap and efficient cars that run on water. ..."
Enzyme-powered reactions are slow and low yield. This is because enzymes are essentially powered by Brownian motion and only function in a narrow temperature range between about 60 and 100 F where there is sufficient energy to agitate the molecules, but not so much that it destroys their fragile structure. Getting enough hydrogen to heat a home or power a car would take acres of bioreactor tanks filled with tons of fragile and ultra-expensive bio-engineered enzymes, and these would be terribly susceptible to infection and consumption by all the other forms of life in the environment. Manufacturing hydrogen by electrolysis or by enzymatic hydrolysis consumes far more energy than it yields in the final product. This is why hydrogen is not an energy source, but only an energy carrier.